While LED lighting has truly came a long way over the years, there’s still room for improvement, even today. This is because these light bulbs contain a high amount of blue light, which can really hurt your retina – something that’s especially true for children. The blue light also negatively impacts your brain’s chemistry. Costa chose to collaborate with those from La Rioja and Alicanted because they’re experts in coordination chemistry. They’re known for their work with sol-gel, which is a technique allowing for the preparation of metal oxides that have new properties. Nevertheless, Costa can also stand on his own rights as one of America’s leaders when it comes to designing luminescent devices like the LED. He’s also helped with developing photovoltaic energy. This group has successfully worked together in what’s now one of the world’s most competitive fields. In doing so they’ve been able to create a material that’s like sand (silica nanoparticles). It’s able to emit a high-quality white light emitting diode. Currently this sand is still being investigated as a new source of artificial light. However, it’s already proven itself to be quite promising since it can reduce the impact on our vision while also being manufactured in a way that’s much more environmentally friendly. What all this means is that there’s a new type of white light available. It’s of a higher quality because it’s more stable, so it doesn’t hurt your eyes. This is something other researchers attempted to create in the past, but they were only able to create products emitting green, blue, or red light – never white. However, it’s this white light that’s necessary for future exploitation. Additionally, LED that’s made with this new material has been proven to be much more stable than any of the monochromatic lights that were developed in the past. This new light is quite like sunlight – yet another reason why it’s healthier for your eyes. Practically speaking, this new light can replace the color filters we now have. This is because currently we’re dependent on rare materials like Yttrium – something whose extraction process causes a lot of negative side effects on our environment. 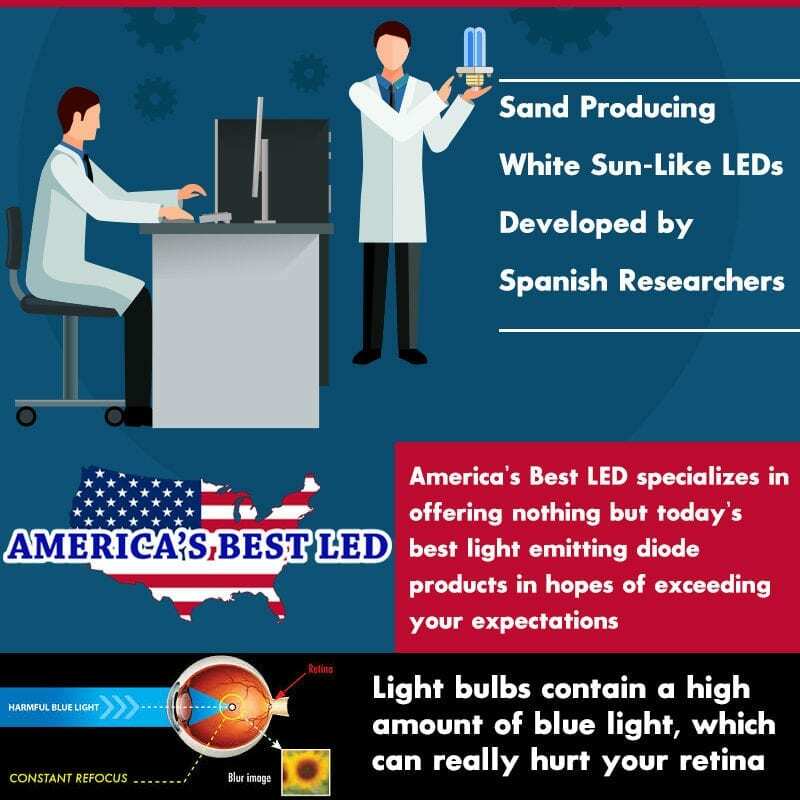 America’s Best LED specializes in offering nothing but today’s best light emitting diode products in hopes of exceeding your expectations. So, now that you have a better understanding of these products and why you want to use them in your home and office, you should reach out to them for all your needs.